Shares of BIDZ.com have fallen off a cliff recently. This was a net-net stock already, but it has still fallen more than 30% in the last month alone. As a result, the company now trades for a discount of almost 50% to its net current assets. Despite this massive discount, however, shareholders should be cognizant of actions on the part of management that could erode the current margin of safety. It has been a year now since I joined Twitter, and in that relatively short amount of time it has become an important part of my investing life! Value investors have a lot to gain from Twitter, which is why I recommend that all readers join Twitter if they haven't already. Hewlett-Packard (HPQ) has seen better days, but its stock price has likely overreacted to the downside. The last time HP's shares were this low was back in 2005, when its earnings per share were about $1/year. Today, its trailing twelve-month EPS is around $4, giving the stock a P/E of about 6! With Bank of America (BAC) trading at just a third of its book value, I frequently receive questions pertaining to its potential as a value investment. Last Tuesday after the markets closed, Dell reported results from its most recent quarter that caused its stock price to fall 10% the following day. While we can never really know why a stock falls (as it is the result of the choices of tens of thousands of decision-makers that mostly remain anonymous), the media widely reports that the stock fell because of Dell's lowered revenue guidance. The market's infatuation with revenue growth can create excellent opportunities for value investors. Last week was an eventful one for potential value stock GTSI. Because of news the company issued after markets closed on Friday, the stock's price action today will be interesting to watch. Depending on how the stock price moves today, value investors may be interested in either buying or selling! No part of the world has proven itself immune to bubbles. Each of the next few chapters examines a bubble from the point of view of the five lenses described in the first five chapters. The topic of this chapter is Tulipmania, a bubble for tulip bulbs that took place in Holland in the 1630's. Some background is in order so that the context is understood. Holland had just gained independence from Spain through war, and was intercepting some Spanish ships carrying goods from the West Indies. The country found itself newly prosperous as an innovative, trade-friendly country. At the same time, however, scores of its population were dying as a result of bubonic plague. Tulips were a relatively newly discovered type of flower (brought over from the Mediterranean) with colour schemes that had not yet been seen before. Many bulbs carried unique patterns, and offspring could not be grown quickly. Because bulbs had to be in the ground most of the year, they could only be exchanged in May and October, so futures contracts were created to facilitate sales that did not take place in those months. At one point during the bubble, many elites (including politicians) lost money when prices retreated. As such, the laws were changed so that futures contracts became options contracts, whereby the buyer would get to choose whether to take delivery of the bulbs when the time came to exchange. 1) Microeconomic: Many buyers were hoarding bulbs, signaling a breakdown of equilibrium pricing. Price was affecting, rather than reflecting demand. 2) Macroeconomic: Due to the capital inflows through successful trade and seizure of Spanish ships, there was a dramatic increase in the money supply in Holland. Easy money was undoubtedly making its way into this bubble. 3) Psychology: The massive deaths caused by the plague were giving citizens a short-term mentality. Since death might be near, thoughts of long-term repercussions to actions were at a low. 4) Regulatory: Because futures contracts were changed to options contracts, highly levered speculation ensued. People could buy the upside of bulbs without much downside, resulting in asymmetric risks. Shortly after the regulation was switched back, prices plummeted. 5) Biological: Citizens in all fields took part, from nobles to chimney sweeps. From the epidemic model, we know that this leaves very few people to be "infected", resulting in an eventual pop. Usually, a company's stock price changes by more than its business value. This is evident by the price volatility that allows value investors like Warren Buffett to buy low and sell high (or in his case, hold forever). But occasionally, a company's intrinsic value does change drastically over a relatively short period. Vicon provides such an example. The Q&A sessions during company conference calls are usually filled with the questions of analysts with very short-term mindsets. This is illustrated by the nature of their questions, which can range from "Is your gross margin next quarter likely to be 23.3% or 23.4%?" to "Were sales in the 3rd week of July higher or lower than they were in the 2nd week in July?". But on the most recent conference call for Blonder Tongue (BDR), a shareholder with a different agenda appeared. The price has fallen so low, that the caller wanted to talk liquidation value! Quarterly results can be very misleading. As value investors, we must think long-term and avoid over-emphasizing recent events. Negative quarters for otherwise healthy companies can occur for a variety of economic reasons, including temporary dips in demand or competitor actions. For growing companies, another cause of seemingly poor quarters is expenses that precede new revenues. This appears to be the case for value stock Parlux Fragrances, which saw a drop in price last week following its quarterly earnings release. The fifth and final lens through which bubbles are considered is the biological lens. The authors describes a couple of frameworks through which this lens can be viewed, namely using epidemic models and emergent behaviour. Mansharamani references Robert Shiller's work in this regard. The idea is that a tellable story infects the population, eventually leading to an epidemic whereby there is a prevalent belief that results in bubble behaviour. If the "idea" that results in bubble behaviour is considered a "disease", the epidemic model can be used to ascertain the relative maturity of the bubble. (Note that this does not allow one to time a bubble, it only gives one a rough idea of the stage at which a bubble has reached.) Epidemic models where the infection rate is greater than the removal rate follow a bell curve in terms of a population's infection (assuming the infection rate is greater than the removal, or cure, rate). Trying to ascertain where we are on that curve can help gauge bubble maturity levels. The emergence framework has to do with how we behave in groups. Various animal groups are discussed whereby seemingly independent individual organisms appear to act as single entities when part of a group. There are a number of signals, both conscious and unconscious, that individual organisms pass on to other individual organisms that result in co-ordinated behaviour. Humans are not immune from this type of behaviour. One example of this behaviour is an information cascade. For example, if a couple happen upon two empty restaurants and have no information about which is better, they may be indifferent as to which restaurant to choose. The next couple will have no additional information, but will see that there is one couple in one restaurant. Believing that the first couple behaved rationally in choosing their restaurant, they may choose the same one. This can occur many times, resulting in one full restaurant and one empty restaurant, even though the empty restaurant might be better. Mansharamani likens this to investors who purchase what other investors have purchased, believing that other investors must have done their homework. The political environment is a major factor in the culmination of booms and busts. As such, this chapter examines the boom/bust phenomenon through the political lens. For a boom and bust to exist, property rights must exist. In other words, a particular entity must have exclusive rights to use or sell some asset. As a result, the author argues that only capitalist countries appear susceptible to booms and busts. In communist countries, the government owns everything so there is no incentive to speculate since there are no profits to be had. Mansharamani then goes on to discuss some political factors that affect the likelihood of booms and busts for countries that fall in between communism and laissez-faire capitalism. When governments place restrictions on property rights, for example, they reduce the incidences of booms and busts. On the other hand, the lifting of restrictions can lead to increases in the chances of booms and busts. Also, when governments focus on the short-term (as democratic leaders often do, because of their relatively short-term mandates), it can lead to increased distortions that lead to booms and busts. Examples of this are minimum wage laws (which increase unemployment, but which are popular in the short term) and rent controls (which reduce rents in the short-term, to the delight of renters, but cause shortages in the long-term). These distortions increase the likelihood of under/over-investment, which increases the likelihood of booms and busts. Universal Power Group (UPG) is a distributor of batteries and other power-related accessories. While it has been cheap for a while, it just got really cheap as a result of the market turmoil and recent results that the market didn't appear to like. LCA-Vision's (LCAV) stock price volatility has helped out many value investors. Many times during the last three years has his stock fallen or risen by 50% or more over the course of just a few months; two such occasions are documented here and here. Now that the stock price has once again dropped to a relatively low level, value investors may want to take yet another stab at this stock. Though the stock price is volatile, the company's cash flow and cash holdings are remarkably stable. LCA-Vision trades for $80 million, despite positive free cash flow and $50 million of cash, against no debt. But the problem is, the company just can't cut costs enough to generate a decent return. Seeing as how the company is now facing its fourth consecutive year of negative operating margins, it's clear that LCA-Vision doesn't have the flexible cost structure I once thought it did. The company has implemented a number of cost reduction programs, including a multitude of store closures. However, even cutting out the weakest stores still hasn't stopped the bleeding, suggesting there wasn't a whole lot of variability in the financial situation of individual stores. There is a fixed cost element to every location, and it seems even the strongest stores aren't able to drive enough revenue to overcome this amount. Marketing spend per person ticked up last quarter as well, as the company desperately tries to lure people in. But things don't seem to be getting any better. Deferred revenue has fallen significantly in the last six months, suggesting that even the low revenue number the company recently booked is high compared to what it will look like in the future. Management is taking rational steps to improve the situation. Since cost-cutting hasn't done the trick, the company is looking to generate additional revenue streams by offering services it hasn't offered before. This could work in helping to amortize the fixed costs of the locations across higher revenues, but may not be worth betting on for risk-averse investors. As humans, we tend to believe our successes are due to skill, and our failures are due to (bad) luck. To avoid falling prey to this bias, we should consciously scrutinize our investment results with a willingness to take responsibility for poor decisions and attribute some of our successes to luck. As LCAV has been unable to pull itself out of its losses now for many years, it may be an example of the latter. Thanks to a volatile Mr. Market that has occasionally become overexcited with respect to this security, LCAV has generated terrific returns for investors who bought low. Though this phenomenon may indeed reoccur, value investors may not want to count on it. "I disagree with the idea that an investment that has a non-trivial probability of a large loss is necessarily a bad one. I would claim that the key metric is the investment's Expected Value (EV)." Intuitively, this makes sense. But I would argue that EV should not be the metric by which investors make their decisions. If you're a value investor, you've been waiting for prices like these. Generally, economic models assume individuals are perfectly rational. That is to say, they weigh costs and benefits appropriately, and seek to maximize profit with the cold-hearted zeal of a calculating machine. But recently, a new field called behavioral economics has shown this to be a simplistic view. Humans actually have a number of biases, many of which (discussed through example later in the book) contribute to bubble-forming events. Mansharamani discusses a number of biases and offers a number of quizzes and puzzles to the reader that illustrate how we fall victim to biases without ever knowing it. Many of the biases fall under the category of heuristics, whereby we seek shortcuts in our brains in order to determine the answers to complex questions. Among some of the biases illustrated and discussed are overconfidence, anchoring, framing, representativeness and availability. A number of these biases have been summarized a few times in different ways on this site, including here. 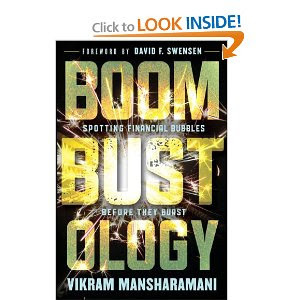 This chapter considers the macroeconomic lens through which bubbles should be viewed. First, a justification for expanding beyond simple microeconomics (as discussed in the first chapter). Just because individuals may do things that maximize their own interests, it does not always make everyone better off in the aggregate. For example, someone may be better off standing (rather than sitting) at a baseball game to get a better view; but if everyone else decides to stand as well, everybody is worse off than they were before. For a financial example, a bank may feel it is in its interest to foreclose to sell a house to recover its loan, but if all banks are doing it at the same time, they will drive down prices and make things worse on themselves. For these reasons, an understanding of macroeconomics is important to understand bubbles. Mansharamani describes a couple of models to help explain how bubbles and macroeconomics interact. In particular, he describes the theories of Hyman Minsky as well as those of the Austrian school of economics. Minsky described the macroeconomic state of affairs as going through three stages of debt. Normally, debt levels are taken such that cash flow is adequate to comfortably pay interest as well as principal. But if things stay stable for long, debt will then graduate to a speculative stage, whereby cash flow is only enough to cover interest, with the expectation that refinancing the principal will be possible later. Eventually, debts issued are of a Ponzi nature, where cash flows don't even cover interest, as the expectation is that asset appreciation will allow the borrower to pay debts by incurring even more debts. Eventually, credit tightens. When this occurs, turmoil ensues, as a debt-deflation spiral occurs. As assets are sold to pay debts, asset prices fall further, causing real debt (that is, debts relative to assets) levels to increase, exacerbating the situation by causing more asset sales still. In the Austrian school, the belief is that central banks are causing distortions by forcing an interest rate on the economy. When rates are set low, for example, incentives are given to avoid saving and to over-consume. These distortions can lead to overcapacity in some areas and under-investment in others. The idea is that central banks should not interfere in the market-clearing interest rate, as otherwise the distortions will play a detrimental effect later. Even though it is run by the best investor in the world, there are a few reasons not to like Berkshire Hathaway (BRK) as a stock. At the risk of turning this blog into a site dedicated to the comings and goings of hhgregg (HGG), this is yet another post dedicated to drilling down on this company. Last week, a reader responded to the post discussing hhgregg's ROE breakdown with the statement that "I'm not sure if ROE is the right metric" and subsequently provided some calculations whereby he concluded that he believes "its clear that this company does not manage to earn its cost of capital especially if we assume a mild 12% cost of equity." My response to this reader's comment contains enough points to warrant its own post. The mainstream finance profession will have you believe that risk is akin to price volatility. Unless you are a short-term trader, this is wrong; a change in a business' price rarely affects its operations. Real investment risk has to do with the business risks faced by each of the companies in a portfolio. Yesterday's 50%+ drop in the share price of Insmed (INSM) demonstrates this disparity of definition very clearly. Prior to the steep drop in Insmed's price yesterday, the company had a beta of -0.15. This suggests that the company's price volatility was rather low relative to the market. To mainstream finance enthusiasts, this would suggest that the stock was not risky as part of a diversified portfolio. In reality, however, this company's risks were (and still are, despite the 50% price drop) extraordinary. First of all, the company is losing money. Unlike other companies that are losing money, Insmed cannot just cut costs and shrink down to its most profitable niches/segments/locations. This is because Insmed has no profitable segments! The company is betting heavily on the market's acceptance of a new drug (currently undergoing FDA clinical trials) that it has developed for the treatment of lung diseases and infections. If it works out, shareholders will of course do very well. But investors should not be focused on the "if all goes well, I'll do very well" scenario. Instead, investors should analyze risk by focusing on the "if things go wrong, what will happen?" scenario. In many cases, things won't go wrong, and so even the investor who pays no attention to risk will do well. But to avoid losing principal, prudent investors seek to invest in companies where the likelihood of things going wrong is low and where the damage won't be large even if things do. Insmed fails on at least one of these counts, and shareholders paid the price yesterday, as the company is now worth half of what it was the day before. The news came out that the FDA has placed a hold on Insmed's Phase III trials of the aforementioned drug after reviewing the data from a previous trial. It is, of course, entirely possible that the trial will resume and that the company's product will go on to have a successful future. Unfortunately, there's little to no fallback for this company if things don't work out. As such, investors who buy into this company while it trades for more than its cash balance are risking significant portions of their principal. Market participants can be roughly divided into two groups: short-term speculators and long-term investors. Nowhere is this dichotomy more clear than in shares of RadioShack (RSH), which have taken a beating for most of this year. From a short-term perspective, this company's recent operations look downright awful. EPS is expected to come in some 40% lower than last year, for a number of reasons. Problems with suppliers (a disagreement with T-Mobile has put a crimp in that sales category), supplier policy changes (Sprint toughened-up its upgrade policy for consumers), problems with partners (Sam's Club takes control of RadioShack-operated kiosks) and operational changes (closure of its Chinese manufacturing facility) are all contributing to what will be a sub-par year financially for the firm. But for long-term investors, many of these problems appear transitory. The company will be shifting to a bigger wireless player in Verizon (from T-Mobile), it has ramped up its kiosk business at Target to replace the Sam's Club loss, and it can now source its private-label products in Asia without the fixed costs associated with having a dedicated facility. For most of this year, the short-termers have beaten the stock price down. But this has created an opportunity for those who can see past these temporary difficulties. Over the last ten years, RadioShack has averaged earnings of $225 million per year. Today, the company trades at just 7 times that number, despite the fact that its net debt to equity level is under 15%. Managements, too, can have either a long-term or short-term perspective. RadioShack's management appears to be of the former suasion. The company has shown a willingness to take the short-term hits to profits in order to position the company for a brighter future. Furthermore, management has used the weakness in the price of the shares to buy back shares with a vengeance; the company has 20% fewer shares outstanding than it did at this time last year. There are those who would extrapolate this year's profit drop indefinitely, on the premise that RadioShack's business model is dead. This would be a mistake. Last year, the company's return on equity was over 20%. Furthermore, the company is poised to take advantage of the growth of smartphones and other mobile devices (e.g. tablets), which are "high-touch, high-service transactions" for many consumers. Furthermore, management believes it has not executed well at attaching its high-margin accessories to mobile product sales; this means there is an opportunity for improvement as management strives to get it right. Short-term profit drops can be deceiving. A better gauge of what a company can earn in the long-term is provided through the use of several years worth of earnings data. For more on RadioShack, see this article. Rising gross margins are almost always cheered by market action. But a myopic focus on this figure can get a company and its investors stuck in a short-term mentality. Yes, increasing gross margins can signify pricing power or cost advantages. But higher prices and lower costs can also make short-term profits look good while actually hurting the business in the long run. (For example, a company could cut its service levels, raising gross margins now, but resulting in customer losses in future periods.) Consider SuperValu (SVU), which is using this phenomenon to its advantage.